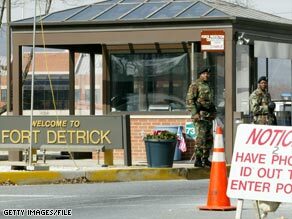 The Army’s Criminal Investigation Command agents have been visiting Fort Detrick in Frederick, Maryland, to investigate the disappearance of the vials. Christopher Grey, spokesman for the command, said this latest investigation has found “no evidence of criminal activity.” The vials contained samples of Venezuelan Equine Encephalitis, a virus that sickens horses and can be spread to humans by mosquitoes. In 97 percent of cases, humans with the virus suffer flu-like symptoms, but it can be deadly in about 1 out of 100 cases, according to Caree Vander Linden, a spokeswoman for the Army’s Medical Research Institute of Infectious Diseases. There is an effective vaccine for the disease and there hasn’t been an outbreak in the United States since 1971. The vials had been at the research institute’s facility at Fort Detrick, home of the Army’s top biological research facility, for more than a decade. The three missing vials were among thousands of vials that were under the control of a senior scientist who retired in 2004. When another Fort Detrick scientist recently inventoried the retired scientist’s biological samples, he discovered that the three vials of the virus were missing. The original scientist’s records about his vials dated back to the days of paper-and-pen inventories. During the investigation, the retired scientist and another former Fort Detrick researcher cooperated with investigating agents and, according to Vander Linden, they came back to the facility to help look for the vials. Vander Linden said the investigators know that several years ago an entire freezer full of biological samples broke down and all the samples had to be safely destroyed. But a complete inventory of what was in the freezer was not done before the samples were destroyed. Vander Linden said there’s a “strong possibility” the vials were in that freezer and destroyed, but that isn’t known for sure. This investigation comes two months after all research at the research institute facility at Fort Detrick was halted for a complete computer-based inventory of all disease samples at the fort. That inventory is expected to be complete before summer and may help solve the mystery of the three missing vials, officials said. The Army investigation is in its final stages and is expected to be closed soon.